Maine Gov. Paul LePage speaks at the 23rd Annual Energy Trade & Technology Conference in Boston, Massachusetts, Nov. 13, 2015. AUGUSTA, Maine — Senate Republicans’ attempt at a compromise on Maine’s two-year budget took hits from two sides Thursday, the second-to-last day before a potential government shutdown that looks likelier by the hour. Gov. 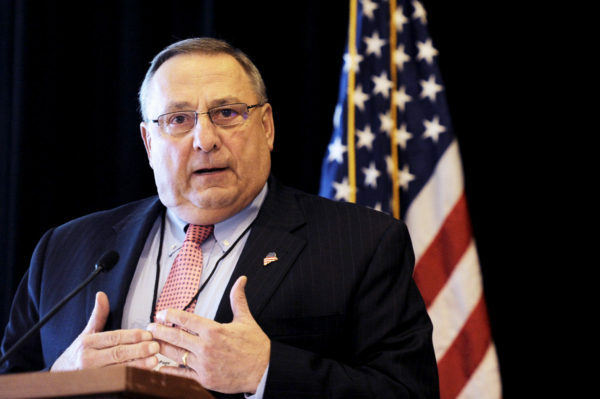 Paul LePage vowed again Thursday to shut down state government if the Legislature votes for a lodging tax increase, an idea the governor originally proposed in January that Senate Republicans resurrected Wednesday. That proposal drew fire Thursday from LePage, who accused Senate President Mike Thibodeau, R-Winterport, of just wanting to “go home” at any expense to the state budget. With fewer than two days left in Maine’s fiscal year, these statements cast a darker cloud over a situation in which there is a path to enactment of a state budget in time to avoid a shutdown, but one that is narrow and fraught with obstacles. Thibodeau worried on the radio about whether the Legislature would meet its deadline. On Wednesday, Senate Republicans came to the table with some new concessions, including $146 million in additional education funding over the last budget cycle — more than their previous proposal — alongside funding for direct-care workers and a partial restoration of property tax relief programs. To help fund some of those items, they proposed raising the state’s lodging tax from 9 percent to 10 percent — but remain firm on repealing the education surtax enacted by voters in 2016. It’s not clear where Democrats and House Republicans stand on the latest offer, but it’s clear where LePage stands: He’ll cause a government shutdown by holding the budget for the 10 days Maine law gives him to make a decision about whether to sign or veto bills. The governor said he is open to increasing education funding by $200 million over what is being spent in the current biennium — which is the goal of House Speaker Sara Gideon, D-Freeport — but only under very rigid circumstances: Repeal the surtax, enact education reform proposals that have already been rejected by the Legislature — such as administration consolidation and a statewide teacher contract — and wait to see if those proposals generate new savings. “If we don’t reach the goal of the $200 million [between now and July 2018], then we’ll put in a supplemental budget for the funding that you need,” LePage said. It’s still unclear whether enough Democrats would go for the Senate Republicans’ deal at this point. Rep. Mike Sylvester, D-Portland, a progressive who led a May pledge from many Democrats saying they wouldn’t vote for a budget without a “progressive and sustainable funding source” for public education. He said progressives found the Senate proposal unacceptable. The only hope of avoiding a shutdown at this point is for a deal to be struck Thursday, a budget to garner two-thirds support in the House and Senate on Friday, and for LePage to either sign or veto the budget immediately. All of those things looked difficult on Thursday morning. Even in that scenario, the Legislature could have to convene Saturday to override the veto with the government shut down around them. Meanwhile, the governor further torched his relationship with Thibodeau, which has been troubled for years, over the Senate Republicans’ proposal for a lodging tax increase. Thibodeau has advocated against tax increases throughout negotiations until Wednesday, arguing that concessions are necessary to break the impasse and that the lodging tax hits mostly out-of-staters. In a radio interview on WVOM on Thursday, he sounded more pessimistic about a deal, saying, “For the first time, I’m really beginning to wonder if we’re going to meet our deadline that we desperately have to meet. This item was originally published in Daily Brief, a free political newsletter distributed Monday through Friday by the Bangor Daily News to inform dialogue about Maine politics and government. To read more of today’s Daily Brief, click here. To have the Daily Brief delivered daily to your inbox, click here.